‘Confidence in a can’ is a slogan derived by friends as part of their marketing titbit for a recently launched roll-on/deodorant spray targeted at young adults. The mantra follows the new age marketing gimmicks and social media punchlines that lead us to define our 21st century identity by the toys (gadgets) we use and the expensive stuff we wear (deodorant sprays and roll-ons inclusive). The goal of being confident though is to transmit that confidence to the people we face so that they can believe us and what we have to offer. This is true for job interviews, applying for opportunities and communicating with people. If our goal is to inspire confidence, then our ‘sense of confidence’ derived from the trivial things listed above can only go some way. Due to different reasons, we may not be able to dress overwhelmingly well, or speak properly or show ourselves at every opportunity. When those variables exist, how do we still impress? Where does confidence come from? To find the root of confidence, we have to trace it to our childhood. This is because children don’t need the extra accessories to inspire confidence in us. A kid is never more confident than when they have either done something new or different, or have found out something knew. True confidence comes from insight and ability because they are the only factors that would ultimately convince the people we engage with. The ability to sit and learn, what many would not learn, can boost confidence. The patience to avoid mediocre work/art and un-scrutinized ideas will win us lasting friends more than our status quo regalia would. It is important to note that you cannot always dress the best or wear/use the most expensive accessories. But you can learn something that counts, that someone else would be delighted to hear you exhibit or speak about. 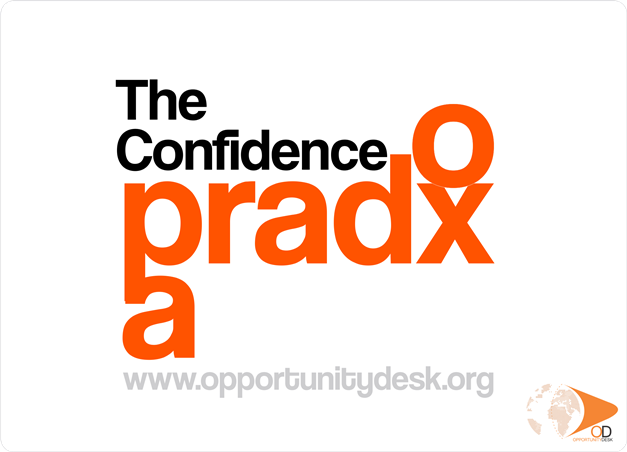 Opportunity Desk is the one stop place for all opportunities, including conferences, scholarships, fellowships, jobs, internships, competitions, funding among others. This blog details success stories and valuable tips for winning any global opportunity.